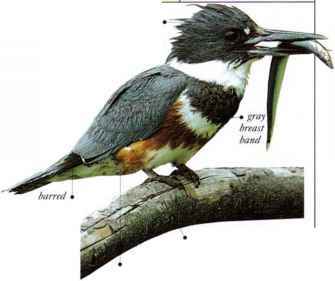 This bird inhabits northern forests, coniferous as well as mixed, feeding on insects. 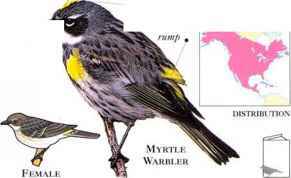 The eastern form (Myrtle Warbler) has a white throat and the western form (Audubon's Warbler) has a yellow throat. 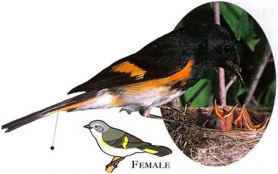 • NEST A lined cup nest of grass and small twigs, in a tree. North and Central America. Winters in W. and S. USA, West Indies, and Central America. The bright wing and tail patches of this woodland spccies flash as it darts after insects among the foliage or hunts them in the air. • NliST A bulky cup in the fork of a sapling or small tree. • DISTRIBUTION Breeds in Canada and K. USA. Winters in West Indies, Central America, and N. South America. 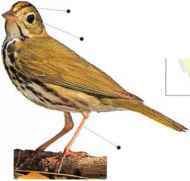 A dull, soberly colored bird of thick undergrowth in woodland regions, the Ovenbird walks on the ground, searching the leaf litter for small invertebrates. It is common and is not a shy bird, often sufficiently curious to approach people tpiite closely. • NliST A domed structure of leaves, dry grasses, and weed stems, lined with tiny rootlets, and placed on the ground. • DISTRIBUTION Breeds S. Canada and K. USA. Winters in Florida, West Indies, and south to N.W. South America.